To understand how Demand CS works you must first know what it is. Demand CS is a microencapsulated water-based formulation offering superior insect control. Compared to older pyrethroid materials that have been used for many years with declining results, it is up to 200 times more active on flies and other animal health pests allowing lower rates. And it’s designed not only to work better, but to work longer. Demand CS controls over 30 insect pests including: Ants, Bees, Carpet Beetles, Centipedes, Cigarette Beetles, Cockroaches, Confused Flour Beetles, Firebrats, Fleas, Ticks, and more. 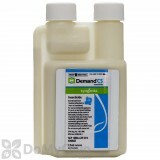 Demand CS Insecticide Concentrate is ideal for general, broad-spectrum pest control, perimeter applications, and crack and crevice treatment indoors. 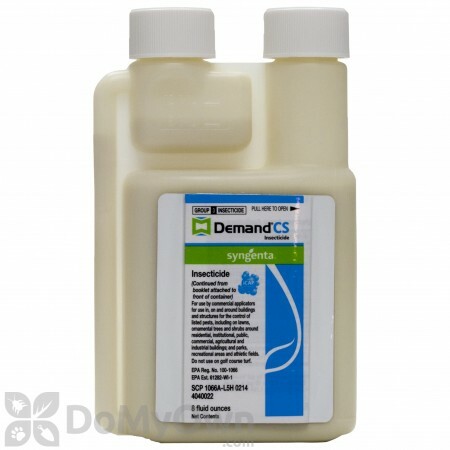 Demand CS is also ideal for treatment of flying insects such as mosquitos, lawn and ornamental pests such as ticks and fleas, and crawling pests such as spiders, beetles, and scorpions. See complete list of pests below. Use indoors (crack and crevice only) and/or outdoors. Best applied with a 1 gallon sprayer. Apply to outside foundation and all entry points such as around windows, doors, etc. Always read the label completely before use. 8 oz. 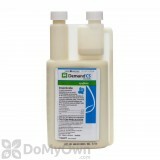 bottle yields 10-40 gallons of finished solution for standard application rates. Quart (32 oz.) bottle yields 40-160 gallons of finished solution. Watch the video on this page for general use mixing and application instruction using a 1 gallon sprayer. In, on and around buildings and structures for the control of listed pests, including on lawns, ornamental trees and shrubs around residential, institutional, public, commercial, agricultural and industrial buildings; and parks, recreational areas and athletic fields; food handling establishments; livestock/poultry house structures; pet kennels. Use as a crack and crevice treatment only. May apply at 21-day intervals. Remove pets or children from treatment area until product is dry. For bed bugs – Use 0.2-0.4 fl. oz./gal. of water. Do not apply to bedding or to mattresses or furniture surfaces where people will be laying or sitting. May be converted to a foam for treatment in structural voids. If using a hose-end sprayer, calibrate to 0.2, 0.4, or 0.8 ounces, and use 1-5 gallons of water per 800-1600 square feet. Higher volume applications will result in better coverage, particularly for mosquito control. For ornamental pests – Use 1.5 – 5 fl. oz (44-148 mL) / 100 gallons of water – May be applied at 7-day intervals if necessary. Use lower dilution rates for more frequent applications or limit to spot treatment. The addition of a spreader sticker may increase application to waxy foliage. When using large tank mixtures, use a buffering agent if necessary to keep pH from 5-7. For thatch or subsurface inhabiting pests, use irrigation after application or higher water volumes to carry the active ingredient to the target pests. Convenient squeeze and pour container makes measuring and mixing easy. Has no harmful effects on earthworms, soil processes, or soil microorganisms when used correctly. Add Demand CS last when tank mixing with other products. We live at the base of the McDowell Mountains in North Scottsdale where crickets, spiders and scorpions are everywhere. I applied Demand CS right before sunset and the following morning it looked like an atomic bomb went off in my yard. Dead crickets, black widow spiders, cockroaches and last but not least the follow evening a slowly dying scorpion in our bedroom that accidentally crossed the wrong path. In nearly three weeks since we applied the product, I have yet to see ONE single cricket, spider, or cockroach. Great product! We own a log home and have been plagued by carpenter bees. We have tried several other products: powders, liquids, professional and home store strengths and this is by far the best! It is non staining and easy to apply with a garden pump sprayer. After application, we watched the bees hover a minute and then decide to take up residence somewhere else. Those that stuck it out, were dead in the morning. It is almost instantaneous! We also applied it to our barn and found it killed bugs that we didn't even know we had a problem with. Try this product= it works!!! We have tried several pest control companies to eradicate our recurring summer sewer roach problem to no avail. When the city treats the sewer drains and manholes, the roaches come into our yard and house. We also live in an area with crickets and tiny black ants. Nothing seemed to stop everything until we tried Demand CS. I read the label carefully and found that the strongest wipe out dose was for scorpions. I carefully measured, mixed, and sprayed the yard, block wall, foundation, windows and doors. The next morning was like a nuclear winter. Dead roaches, ants, and crickets everywhere. Our gardener cleaned them up like leaves. We now use the maintenance dose every three months and have not had a pest in a year. Awesome Stuff!!! Demand CS kills fleas that we could never get rid of before. Dead on contact. Bought a neglected house with roaches all over the yard. After spraying 24 gallons of Dursban over a two month period I was still seeing too many roaches to count at night. I put Demand CS down and the next morning had over 60 dead roaches, 30+ more the following day and in 1 month and only 2 applications I'm down to 1 or 2 a day outside (dead) and none inside in a month. I've been outside at 11pm on hot nights and not seen one live roach! This is magic. What's the difference between Demand CS and Suspend SC? Both products have an active ingredient that is classified as a synthetic pyrethroid, so they really are very similar in the way that they work. Suspend SC contains the active ingredient deltamethrin and is a bit more versatile when it comes to bedbug treatments though as it can be sprayed on mattresses, carpets (spot treat only) and on furniture (crack and crevice only). Demand CS cannot. Demand CS contains the active ingredient lambda-cyhalothrin, and it is micro encapsulated which will make it last a little bit longer in outdoor applications. Is Demand CS safe to use around children and pets? What's the risk of transfer since Demand CS is capsulated? For instance, we have hardwood floors and we vacuum the floors and the baseboards. Can the insecticide be transferred from the vacuum to another surface (such as when vacuum rugs and couches) and increase the risk of contact? If you are applying the product correctly, it should only be in cracks and crevices and other closed off areas. There should not be any issues with transfer effect like you are speaking of. Once you apply Demand CS, the tiny microscopic balls of insecticide will bond to porous surfaces and will not be removed by general cleaning or vacuuming. You should allow 30 minutes after application for the product to dry before cleaning or allowing children and pets to re-enter the room. Does Demand CS kill stinkbugs? Absolutely. Although stink bugs are not specifically on the label, the active ingredient Lambda Cyhalothrin in the Demand CS has shown great results on Stink Bugs. Many of our customers buy Demand CS for stinkbugs and the customer feedback has been great in regards to the results. Should I mix Demand CS with Suspend SC and Gentrol? I've seen the ability to mix Gentrol with either Demand or Suspend, but can all 3 be mixed? Seems this would offer the best combo for heavy knock down, lingering kill, and nymph control to potentially pyrethin resistant bed bugs. Also, can you confirm the pyrethrin resistance rumored in bed bug populations? There are indeed strains of bedbugs that are resistant to synthetic pyrethroid insecticides. Synthetic pyrethroids such as Suspend SC and Demand CS are the man-made versions of natural pyrethrin insecticides such as Exciter or Pyganic Pro. There is no valid reason to mix Suspend SC and Demand CS together, it would not make either product work better or produce better results, though it could make treated areas repellent to bedbugs lessening the effectiveness of the treatment. Both Demand CS and Suspend SC can be mixed with Gentrol IGR for a good knockdown and to break the growth cycle of the bedbugs and their eggs. If you do have a problem with a pyrethroid resistant bedbug population, you should use Phantom and Gentrol together. Phantom is not a pyrethroid, it is from a class of insecticides called pyrrole and there is no known resistance from bedbugs to this product. We also highly recommend that you use an aerosol with a straw attachment such as Phantom aerosol for the small cracks and crevices and a dust such as MotherEarth D for long lasting residual control. Is spraying Demand CS to eliminate bed bugs in the house perfectly safe for my children under 8, and my dogs? Using Demand CS indoors for bedbugs is safe as long as you follow the Demand CS product label. Be sure to have all children and pets out of the area while you are doing the application and they can return as soon as the treated area is dry.